The Amazing Spider-Man Made Me Nauseous. This Pleases Me. As the Beenox representative controlling The Amazing Spider-Man during the game's E3 2012 presentation launched Peter Parker off the top of a tall building in virtual New York City, my stomach heaved sympathetically. The piece of pizza I had consumed during a previous meeting (thanks, Sony Online Entertainment!) threatened to make an encore appearance all over the floor of Activision's fancy E3 press booth as Spider-Man plummeted towards the street, towards those unsuspecting pedestrians unaware of the red and blue streak rapidly descending upon them. If I were Spider-Man, I wouldn't be able to wear a mask that covered my mouth. If I were Spider-Man in Beenox's latest video game, the Daily Bugle wouldn't need to run a smear campaign; the city of New York would come to fear the sounds of retching from on high. 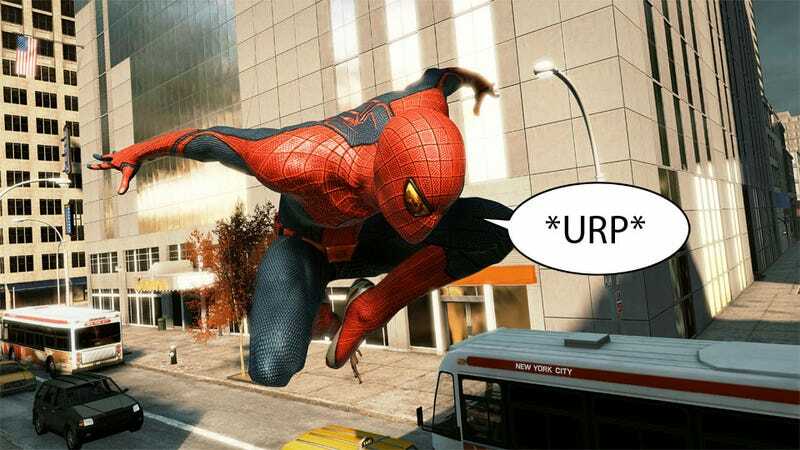 Attempting to deliver a more personal Spider-Man experience than ever before delivered in video game form, Beenox has parted ways with the traditional pulled-back 3rd person camera in favor of an over-the-shoulder view that demonstrates just how incredibly insane Peter Parker really is. No one in his right mind would purposefully throw himself off of a building like that. The heaving of my guts continued as Spider-Man swung through the streets, battling robots created by Dr. Spencer Alistair Smythe (curse you, continuity!) to battle the rash of animal hybrids — Rhino, Scorpion, etc, — plaguing the city in the story that follows the events of the blockbuster film. Peter Parker just so happens to be one of these animal hybrids, so he gets to kick robots acrobatically while somehow managing to keep himself from face-planting into the side of a skyscraper. If I were bitten by a radioactive spider... well, I'd probably get very sick and possibly die. If necrosis didn't claim me and I somehow developed super-powers, I would be the amazingly buff walking really fast guy that kept himself out of trouble. But not Peter Parker. He creates a chemical compound that allows him to swing through the streets of New York, magically avoiding heaving all over the city that never sleeps. I can barely make a baking soda volcano. The rest of the demo involved zipping about the city via the nifty web-slinging mechanic that allows Spidey to map out a series of points and traverse them with his signature dizzying acrobatic flair, and a look at his fighting techniques, which were as flashy as one would expect. We even got a brief glimpse of a battle with Rhino in an enclosed lot, video game developers' preferred spot for said battle. The fighting and the flipping, while lovely, are not what I look for in a Spider-Man game. It's the swinging, and The Amazing Spider-Man puts you in Peter Parker's sneakers (bah) more immediately than any game before it. I might throw up, but it'll be a happy sort of throwing up. The Amazing Spider-Man hits stores on June 26. I'd suggest eating colorful foods before playing. It'll be festive.